We pulled into Madison right on time…coming into town and passing between the two lakes to head towards downtown and Willy (Williamson) Street. Madison advertises itself as “Lake. City. Lake.”…and it was as beautiful as the brochures! When we pulled into the Willy Street Co-op, they had a spot all marked out for us, so we quickly pulled in and set up. Willy Street is a diverse and eclectic walking area…very similar to Uptown in Minneapolis. 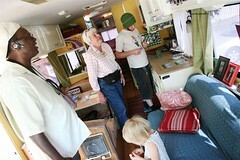 We enjoyed talking with all kinds of people…many that were already very well versed in using veggie oil as fuel. We found many already running straight veggie or biodiesel. We met Dorothy, a beautiful and intelligent older woman from Prague, Czech Repuplic. Her husband, Erazim Kohák, is a Czech philosopher, writer, and expert in ecology. We chatted for quite awhile and she gave Bella some Czech money to add to her ever growing collection of “goodies from the tour”. She invited us to park at one of their homes in New Hampshire when we pass through. We met Sarana and her strikingly beautiful children. Sarana and I have very similar interests and had a great time passionately discussing homebirth, dreadlocks, babywearing, following your dreams, and more. Her husband owns an eco-paint company in Madison and she has a fledgling non-profit aimed at helping inner city children through the arts and nature exploration. Her daughters and Bella played on the bed with all of the toys for a long time…it’s nice to have other children around for playmates. We met Libby, a blog reader that I have conversed with many times online. It was wonderful to meet her and talk about “baby stuff”. She is due with her first in December. She works on the campus of the University of Wisconsin and was a great help before we arrived. She kept us company for a good part of the afternoon…hanging out until her husband came by to check out the RV too. The co-op itself was fabulous. They had a huge deli and salad bar…and I had the biggest, most yummy veggie/hummus pita I’ve ever had…for $2.99! Crazy. We also enjoyed their freshly juiced organic apple/raspberry juice. We stocked up on a few groceries while we were there, and enjoyed talking with many of the employees of the co-op as they came out to the RV on their breaks. So far, Madison has definitely lived up to it’s reputation as a thriving, diverse, and progressive community. As I left the co-op, I looked at their bulletin board and saw organizations such as Community Car and Arboretum Co-Housing Community. There is a lot going on here…bike trails, lakes, activism, crazy fans in Badger red. Good times in Mad City. Sara, do you know the name of the paint store that Sarana’s husband owns in Madison?